You've found the “U.S. Damara Sheep Breeders” page here at Hobby Farm Wisdom! If this is the first time you have visited our site: Welcome! 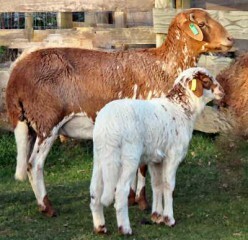 Damara sheep are a unique meat breed completely adapted to Australian climate. They originate in East Asia and Egypt which explains their great adaptation to high temperatures and harsh environments. This breed also excels in walking long distances and rough foraging. The Damara is a fat-tailed sheep. Their color can be solid or multi-colored (black, brown or white) and they grow short, coarse hair. They are also known to be very vigorous and are able to reproduce in unfavorable conditions in regards to water availability and grazing. They have strong flock instincts. Rams have spiral horns and ewes have smaller horns. Both sexes have mobile ears to repel insects. They have an alert disposition with long legs and large deep bodies. Ewes are great mothers, being very protective of their young and produce abundant milk.